When I spoke with artist John Felicè Ceprano, he told me that he has a natural inclination to seek balance, as he had learned to do through Tai Chi. So, to complement the sound of water and to create a more direct link between himself and nature, he began to first look, then touch, then feel the balance of rocks he found in the vicinity. That's one way artist John Felicè Ceprano describes his most famous works. Every spring, John heads out to Remic Rapids in the Ottawa River and balances rocks. When I say "in," I mean "in," as you can see by the pictures. Every winter, nature dismantles them. And so he starts afresh in the spring. His fans wait in eager anticipation, as the first rocks show up early in the spring. 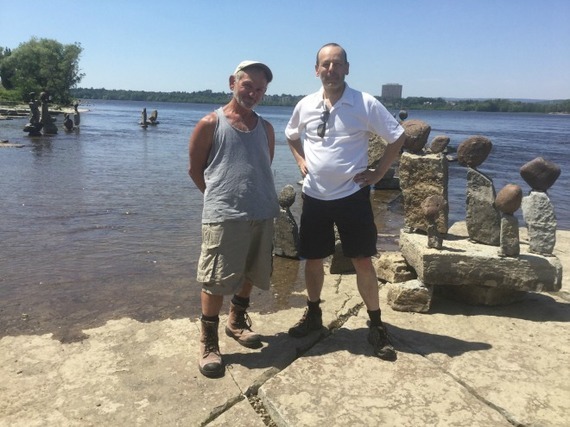 The 69-year old has been doing this since 1986, when he first discovered the soothing sounds of Remic Rapids along the shore of the Ottawa River, secluded by bushes. The ambient meditative sound and peaceful environment brought him back. 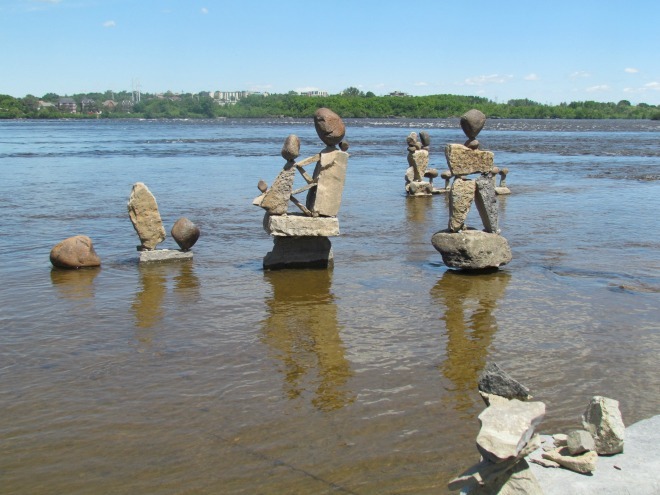 The spring runoff receded, exposing a flat and solid limestone riverbed, a perfect platform to create his now-famous sculptures. When I spoke with John on Father's Day, he told me that he has a natural inclination to seek balance, as he had learned to do through Tai Chi. So, to complement the sound of water and to create a more direct link between himself and nature, he began to first look, then touch, then feel the balance of rocks he found in the vicinity. In 1989, a Canada Council grant supported the project, as locals began paying attention. 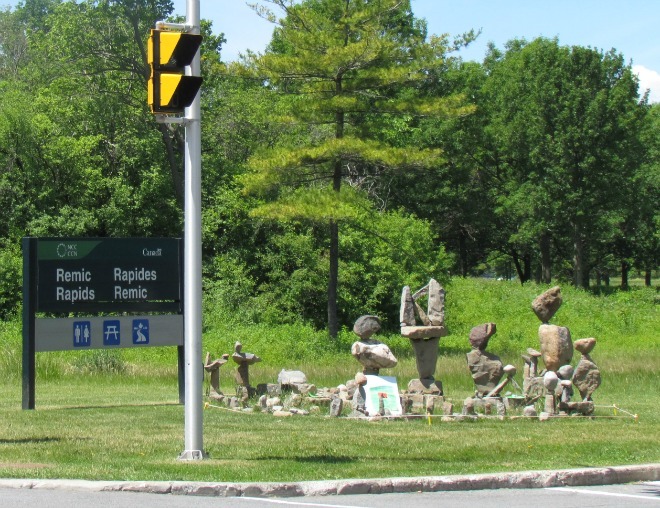 Since 2000, the National Capital Commission has sponsored the project, an internationally recognized mark on the Canadian landscape. Today, the bushes are gone, so that people can appreciate his work. without playing hide-and-seek. 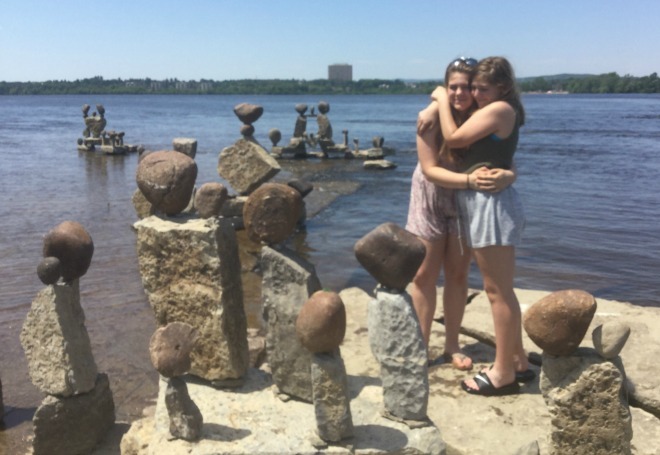 Just a few minute west of downtown Ottawa, this is the coolest tourist attraction that isn't in the brochures. As a result, it's mostly Ottawa residents who appreciate the sculptures. But if you plan to visit Ottawa, take a half hour to come down to Remic Rapids and bathe yourself in both the calming sound of the water and the inspiring site of the balanced rocks. You'll be greeted at the entrance to the parking area by the rock family. It makes its appearance before the spring run-off reveals the limestone tables by the shore. This is the perfect spot for a picnic, which is why my daughters and I were there on Father's Day in the first place. "Wow. How does he get them to balance?" People are asking the wrong question. The bigger question is how does he lift those huge rocks, which four of me together would have a hard time lifting, then place them in a gingerly precarious balance? I was explaining to my girls that he must have some kind of hoist to lift the bigger rocks, then lower them into place. Still held up by the hoist, he would be able to put the smaller rocks in place to keep the large rocks in balance, before releasing the rock from its sling. "No, I lift them myself," he calmly told us not 15 minutes later. John is a small man, full of muscles. He put me doubly to shame with that correction. If I was to describe this artist in one word, after speaking with him for at least half an hour, the word would be "philosopher". He reflects on nature, on the growth of the city, on where humanity is headed, on the good in the world and the bad in the world, on the difference between balance and symmetry and on the various perspectives we can take to view everything around us. If you take a half hour to appreciate the art and the nature of the place, be prepared to take another half hour to chat with the artist if you happen to be so lucky as to meet him.